Yes, it’s true. Eid is only a couple days away. You simultaneously feel rejuvenated and exhausted. Your Mom has invited half of the town over for Eid-Ul-Fitr. There will be family and guests to greet, and iced coffee to drink in the morning. There is plenty of excitement, and yet you feel nervous. What are you going to wear? There is already so much us ladies (and some guys, too!) do in preparation. We get henna on our hands, eyebrows threaded, and an endless pile of chores. The last thing we have time for is taking forever in figuring out what to wear. We got you, though. To help inspire some Eid outfits, scroll down for some affordable pieces that you can put together easily for that flawless mosque group pic. In many countries, Eid-Ul-Fithr mainly falls during a warm season. Therefore, the pieces included in this article are designed to keep you cool, flexible and still very trendy. Fabrics like silk and cotton look elegant together. Cotton helps minimize heat retention and silk provides a strong, elegant finish to complete the outfit. A majority of the most fashionable Eid outfits consist of either a dress, wide-leg pants, a blouse and a silk wrap. South Asian cultures have their own take on this three-piece structure by including a tunic styled shirt, pants, and a scarf. Regardless of the piece you choose, pastel colors have a way of making a statement on Eid morning. The light colors compliment skin tones and assist in managing the summer heat. Don’t be afraid to mix and match prints and patterns as that is one of the simplest ways to put together an effortless, but elegant look. 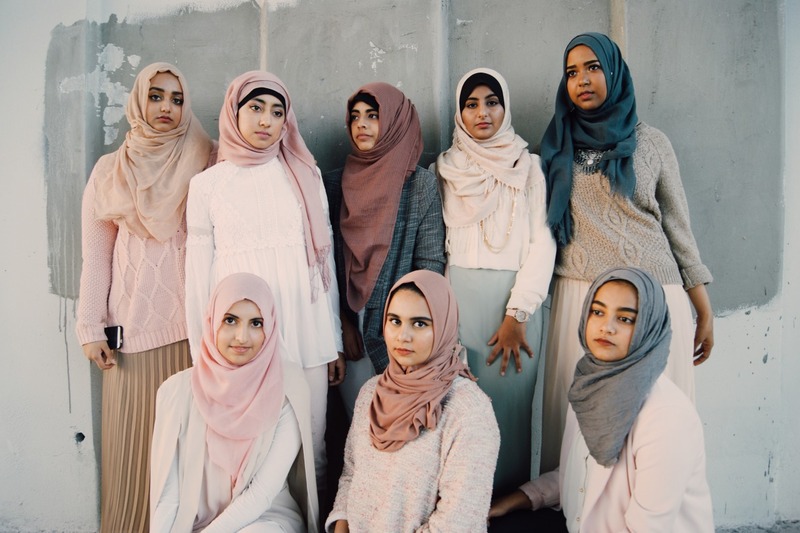 Depending on the look you go for, especially if you keep the clothes on the simpler side, you can always accessorize with a statement hijab or jewelry. Pearls or a mix of silver and gold jewelry makes for a beautiful, polished look. However, be careful not to over-accessorize as that is one of the easiest ways to take away from your look instead of adding to it. Here are a few tricks to look your best on Eid. A big necklace means small earrings or no earrings and vice versa. Unless the jewelry comes as a set, you should not pair a large size of earrings with a necklace. The space between your ears and neck is only so large and instead of taking up so much space you should emphasize the canvas that the jewels will be laying against. There needs to be a bit of blank space for full admiration to come through. Oversized jewels are in this season- but leave room for some elegant minimalism. Wear no jewelry except chunky bracelets, or a single statement necklace. Instead of matching everything to be the same color, take advantage of wearing jewelry to incorporate accent colors. For example, if you wear a white and navy outfit- you can accessorize with gold/silver. But, if you’re feeling particularly bold you can include colors such as orange, green or yellow- all of which would make the outfit significantly more sophisticated. It’s easy to match everything to the same color. This will make you stand out. Whether you wear a hijab or use a scarf to accent your outfit- do not forget about the potential it has to maximize the beauty of your outfit by pairing it with a handbag! Scarves are delicate pieces that pull a look together and add a layer of modesty, particularly on Eid. Instead of letting it drape over your outfit, style it in a way that you enjoy and carry a handbag that matches as its partner. Be sure to tweet or tag us on Instagram in your Eid looks!